I am upgrading my tank to a 55 gallon tank and so far, I will only have my two plain goldfish in the tank. I do not want to add any other fish, as this tank is only suitable for the two I already have, but I would like to add some snails and maybe some shrimp. What type of snails and shrimp could/should I get? I don't want to overstock my tank and I want all of my water friends to get along. Welcome to AA! Unfortunately, shrimp will be eaten but large snails should be fine. Small snails may be eaten as well. Japanese trapdoor snails are an interesting option as they grow larger than a golf ball, are tolerant of cooler temps and only give birth on rare occasions to a few live babies. Please ask if you have any questions! I believe the OP clearly stated that she does not want any other fish. 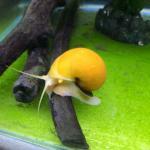 Apple snails will depend on the temp as they are tropical species. I've never had much luck with goldfish and snails. The Goldie's always seem to eat them or harass them to death.